Today, I flew on a commercial airline European flight. 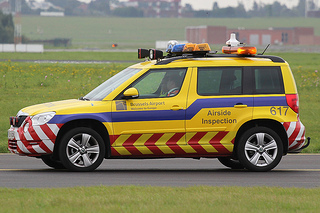 Upon arrival, as I was walking from the airplane to the arrivals gate (across tarmac, no jetways), a yellow car labelled "Airside inspection" sped up to the plane with blue lights and sirens wailing. An officer ran out and blocked people from exiting the plane (some had already gotten out and were allowed to leave). Then, other two people in orange jackets followed him into the plane. Google searches for airside inspection don't produce a lot of material, but from what I could understand these people are charged with checking that the runways etc. conform to safety standards. What reason would they have to approach a plane, sirens on, and block the passengers? As the comments have explained, "airside inspection" is tasked with addressing issues "airside," which means pretty much everything inside the airport perimeter, and outside of the terminals. Just about anything airside will affect the safety of aircraft operating at the airport. For this reason, there are generally many regulations and rules that apply to operations here. Airside inspection involves making sure all of these rules and regulations are followed. This can be anything from addressing security issues to removing FOD (foreign object debris) and ensuring markings and signage are in working order. Since they are responsible for managing activity on the airport apron, they absolutely have the authority to stop anyone that is in the wrong place at the wrong time. Although there may not have been any apparent issue, there could be regulations or dangers that not everyone is aware of. If the flight crew sends passengers out onto the apron when they shouldn't, this is an issue that the airside employees would want to address. There are various descriptions available for positions that involved airside inspection, including some of the duties involved. Maintains safety and security on airport premises; ensures TSR 1542 compliance; patrols,inspects, searches and escorts as necessary; conducts identification checks and permits access only to authorized individuals; provides security training as necessary. Patrols and inspects airport operational areas for potential hazards; ensures compliance with FAR 139 and other federal and local rules; monitors and controls vehicle traffic on taxiways and runways; patrols all airport facilities, airside and landside. Monitors and controls vehicular traffic on taxiways and runways and public roadways and parking lots; checks for proper ID on vehicles and personnel entering the Airport Air Operations Areas (AOA). Ensuring compliance with all safety/security regulations and standards within our activities and ground handling operations. What happens when you call 866-GA-SECURE in the US? What airport has this walkway over a taxiway? What is the busiest airport? What are these red lights next to an airport runway? What is this airport video? In what cases does an airplane return to airport?